These figures all looked great when I got them. I decided to work in Fat Fergus. 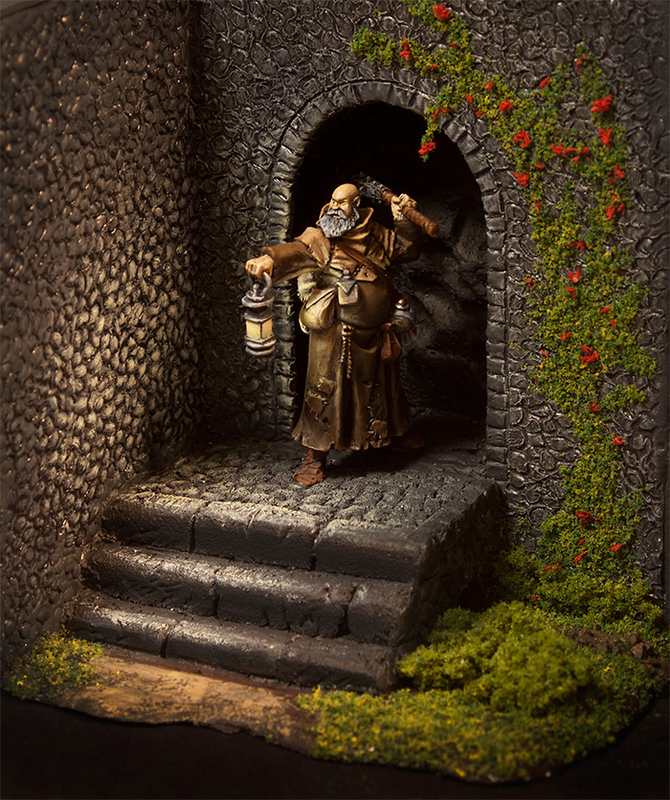 He’s holding a lantern, and I wanted to try to do some object source lighting for the first time. I wanted the light to fall on some objects around him, so I decided that I wanted him standing next to a wall. 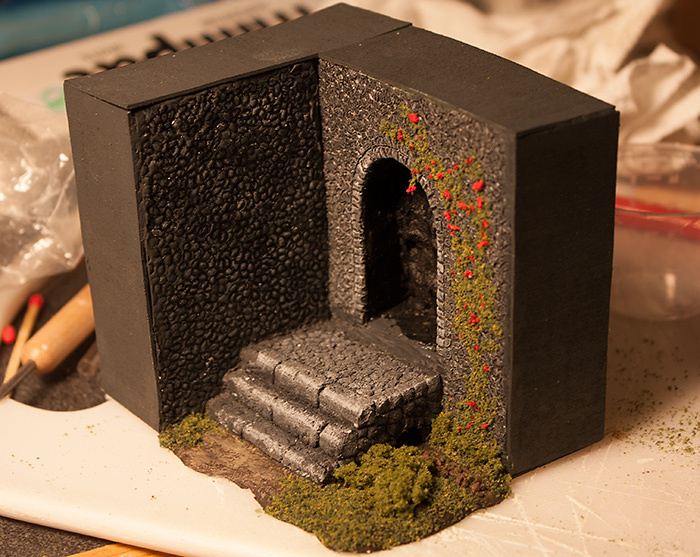 So this was also my first attempt at making a more elaborate base, other than just some groundwork. I used a piece of foam insulation to build the stairs. Nothing too elaborate really, just cut it with a knife, and carved some pattern into it with a sharp tip. I cut out shapes of wood to serve as the foundation for the walls. 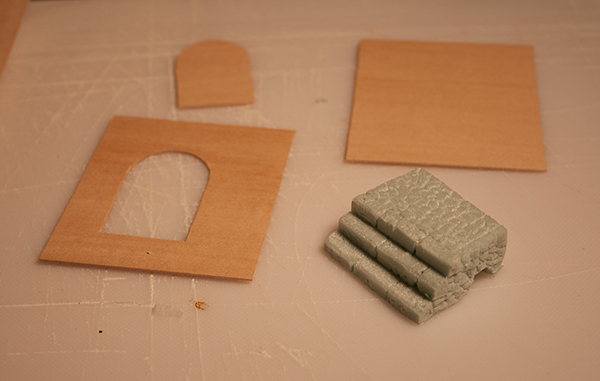 Next I covered the walls with putty, and added a pattern. I used two separate methods for this. For the wall with the door opening, I used green stuff that I flattened out and pressed onto the wood. It didn’t really stick well at all to the wood, and I ended up having to glue it on. I then used a sharp tip to carve in the details of the stones, basically just drawing little uneven circles. In the picture above, this is to the right, and I have already started painting it as well. For the other door, I decided to use Milliput instead. I made a thin sheet that I attached to the wood. This was sticking a bit better than the green stuff, but I still ended up having to use a bit of glue. To put the pattern on this, I used another method – I cut a small piece of plastic sprue, and on the end of it I made a small roundish indentation by pressing a hot round clay tool into it. I made a few like this with slightly different shapes, and then I pressed them into the putty to made the stones pattern. 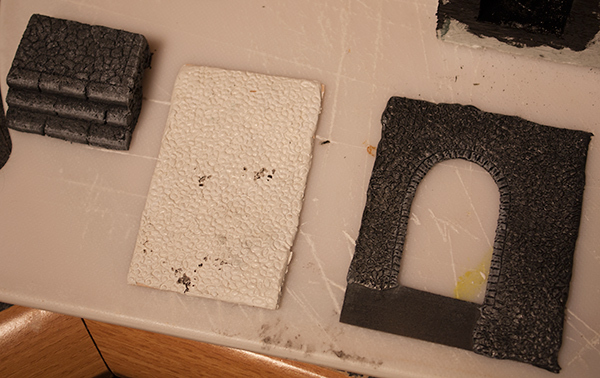 I attached everything to some more foam for stability, and painted with regular vallejo paints. I used some turf and foliage from Woddland Scenic to simulate the vegetation. The red part of the wine is sawdust with red color.